The Monkees – from back to front: Michael Nesmith, Micky Dolenz, Peter Tork and Davy Jones. DAVY JONES – It’s been widely reported, from numerous reputable sources, that Davy Jones has passed away today. Davy Jones was 66 years old. As is being reported, Davy Jones succumbed to a massive heart attack, in Indiantown, Florida. Davy Jones was catapulted into stardom as a vocalist, tambourine player and television actor for The Monkees. This Pop Rock sensation of a band formed back in 1966, went on to sell multi-millions of records, while having their likeness on everything from bubble gum cards to lunch boxes. I remember watching The Monkees television show (re-runs especially) when I was a young lad. It was a favorite of mine to watch with my sister. 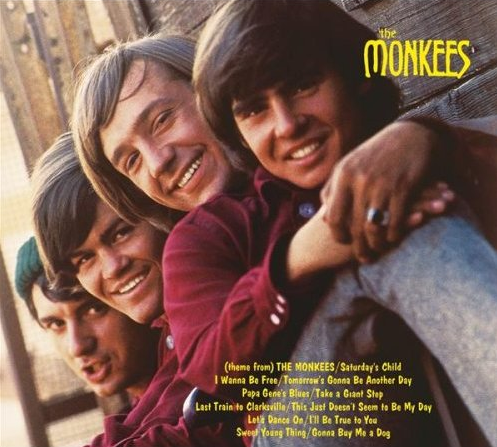 Those songs The Monkees played on their television show grabbed my attention at such a young age… and Davy Jones with his mannerisms and comments made me laugh too. There wasn’t a Disney Channel nor Nickelodeon back in those late 60’s or seventies, instead, we had television shows like The Monkees. Different times decades ago, compared to today. Davy Jones entertained me on that old black and white television set my family shared. I was exposed to those fun songs from The Monkees before I ever knew about Hard Rock and Heavy Metal. Yes, I grew up watching and listening to Davy Jones and The Monkees. There’s no lying about that on my part.